The Asparagus is up! The Asparagus is up! Well, a couple of small tips have emerged through the mulch and on the first of May. It might be several more days before there is enough heat to actually make it grow large enough to pick and at this point I can only find two little stalks coming from the highest and driest part of the garden. Having made that wonderful discovery, I started to wander around the garden and see what the winter had done to various things. I know there is a complicated and scientific answer but I’m still fascinated that the Explorer Rose that I made into a little tree is quite alive and all of its buds are emerging, well above, where the snow line may have protected them. Immediately beside it is a heavily caned regular Rose and all of its canes are black and lifeless right down to the soil line. It may emerge from the soil or it may not. How can these two very similar plants have such dissimilar physiology? I’m always amazed that Clematis ever survives the winter. Those tiny, twiggy vines always look dead even in the middle of summer. I checked several of them yesterday, in my wander and found some doing not much and others happily putting out new pairs of buds over most of their length. There are lots of learned articles on the proper pruning of the various types of Clematis and I have always been going to write a page for the web site about it. I confess to never really understanding the intricacies of the subject and I probably lack the real interest to spend enough time on it. My system seems to work in my climate. 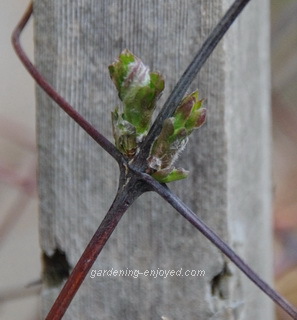 Cut back most of the Clematis vines to a pair of healthy opening buds and remove a few vines completely to control the size. 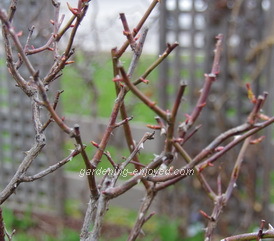 If there are several vines on one plant cut them back to different lengths to get a more spread out bloom. There are a couple that die to the ground each year and that’s easy to deal with. I’m waiting to see if my new Sweet Summer Love Clematis makes it back this spring. It’s a new purple variety that blooms on the current year’s growth like Sweet Autumn Clematis but starts to bloom mid-summer and is purple instead of the original white. It should grow 2 - 3 M tall each year. The doorbell rang yesterday afternoon while I was busy tiling the bathroom wall. It was way to wet to go outside anyway, so the bathroom reno was not cutting into gardening time. The nice lady at the door handed me a small white paper bag and pointed out that my neighbour around the corner had just received his as well. The seed Potatoes had arrived. The urge to rush out and plant them was dampened by the unfinished tiling job and the small lake in the back yard where these Potatoes will eventually find their home. All is not lost. All anxious Potato growers will do some chitting. That’s a British term that means starting the eyes on the tubers to develop into strong growing shoots. Some will start them a few weeks early but I’m not that organized and my supplier Eagle Creek Potatoes will not ship them any earlier because they would freeze in transit. We all know what a “do not freeze” label does on a postage parcel. Potatoes usually have most of their eyes on one end and the Potato should be placed in a cool, brightly lit space with that end up. Some people use egg cartons to hold them in position. Because mine are only going to be chitted for a week or so until I can get them in the garden, I just lay them in a flat and put them on the floor of the solarium. Seems to work just fine. Nancy Asks? Can I plant snow peas with the hardware cloth technique or the chain link fence technique? Ken Answers! I would use the hardware cloth circles for the Snow Peas as they do not grow tall enough to utilize the height of the chain link. I actually plant mine along the top of a little stone wall and let them trail down over it. Looks good and keeps the pods off the ground while using almost no garden space. Paula Asks? Are there any top floating water plants that over winter in our small ponds or do we have to purchase new ones each year. Ken Answers! Not that I’m aware of. The solid blocks of ice that our ponds become, most winters, finishes off any floating plant that I’ve ever had. You can bring a couple of those floaters inside and keep them in your bathtub or other container of water for the winter. That seems like a lot of effort to avoid paying a few dollars for new ones each spring, even for someone as frugal as me. Berenice Asks? What kind of fertilizer can we put on Rhubarb plants? Ken Answers! Rhubarb is a very hungry plant. Most farmers used to dump lots of manure on top of their Rhubarb plants but that is not practical for many of us. Lots of compost and adequate amounts of any balanced commercial, organic or chemical fertilizer will make your Rhubarb thrive.